BookLust: Who cares if you don't understand the story when the words are pretty? Who cares if you don't understand the story when the words are pretty? I feel like all my reviews of Patricia McKillip books are basically the same. "Wow, what beautiful, evocative language! But... not sure I fully grasped what happened here." Alas, the same can be said of my experience with The Bards of Bone Plain. I feel like I was totally jiving with this story until close to the very end, and then I was not at all sure that I knew what happened. Did I over-simplify it? Over-complicate it? Totally misunderstand the symbolism? What happened to the cauldron and the other thing, why was there so much focus just on the tower? And how did the physics of things work? Where was the logic, or was it all just kind of atmospheric? Agh, so confused! Honestly, sometimes the way McKillip goes really deep into the intangibles can be very difficult for me to follow. But there's usually enough of the rest of the story for me to enjoy everything. Here, there's a light steampunk aspect to the novel (very light) and a wonderfully refreshing approach to the way women go about their business and live their lives. And seriously, McKillip can write. Especially her descriptions of music. 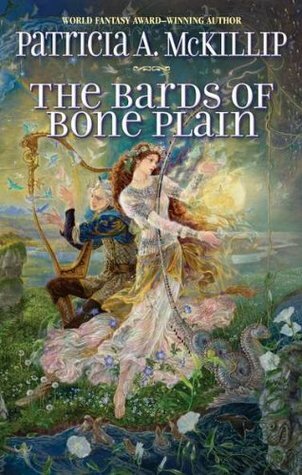 Then he heard Jonah's music melding with Zoe's like silver braided with gold, like sunlight with sky, small birds flying out of his harp, and butterflies out of hers, their voices winding together, sweet, sinewy, strong as bone and old as stone. Together, they transfixed him, spellbound in their spell, his mouth still hanging open, and all the unplayed music in him easing out of his heart with every breath. So yes. Definitely worth the read, especially if you have a deep connection with music. I have still only read one or two books by her. I have this one. I must read some from her this year. Ahahaha, your quote and this post generally just confirmed that Patricia McKillip is not the author for me. It is vanishingly rare for me to enjoy someone's writing enough not to care about the story of the book (Helen Oyeyemi A BIT, but largely because her stories are so creepy and I love that). Alas! People love her so! I've read Ombria in Shadow and had the exact same feeling: beautiful, but... what? Some fans assured me it was just her style, but the truth is that I never really had the urge to pick up anything by her, although Alphabet of Thorn was in the wish-list for a while.